Vega Impactech® Phillips Square-Driv insert bits feature a patented spiral torsion zone that absorbs impact resulting in longer tool life. Vega Impactech® Phillips Square-Driv insert bits' precision engineered tips are manufactured with a proprietary CNC machining process and are made from S2 Modified impact resistant steel. Vega Impactech® Phillips Square-Driv insert bits' are tested to outperform all leading brands in life cycle and tip failure testing. The P125PSD22 Vega Impactech Phillips Square-Driv 2-2 Insert Bits is one of thousands of quality tooling products available from MRO Tools. 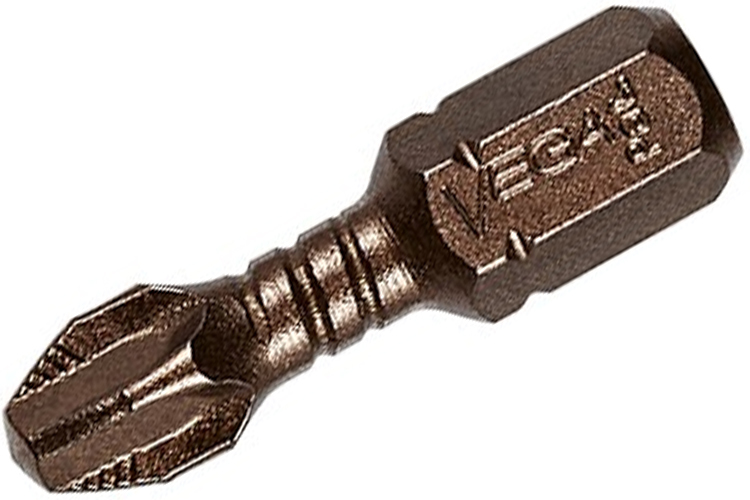 Please browse Vega Impactech Phillips Square-Driv Insert Bits for tools similar to the P125PSD22 Vega Impactech Phillips Square-Driv 2-2 Insert Bits. P125PSD22 Vega Impactech Phillips Square-Driv 2-2 Insert Bits description summary: Vega Impactech® Phillips Square-Driv insert bits. Tip Size: 2-2 Overall Length: 1'' Drive Size: 1/4'' Finish: Gunmetal Bronze Quantity discounts may be available for the P125PSD22 Vega Impactech Phillips Square-Driv 2-2 Insert Bits. Please contact MRO Tools for details.